It doesn’t matter if you are an elite runner or a weekend warrior, if you have ever had chaffing issues, you never want to let it happen again. There are a bunch of different products out there and I have tried most of them. 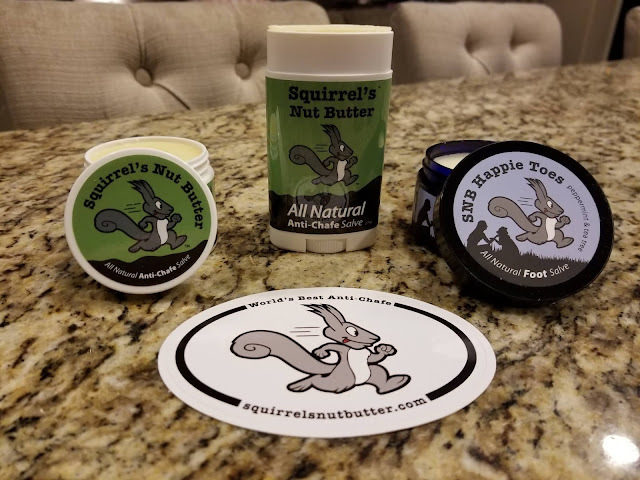 I was given a sample of Squirrels Nut Butter at the Salmon Falls 50k last year and decided to give it a try after hearing great things about it. 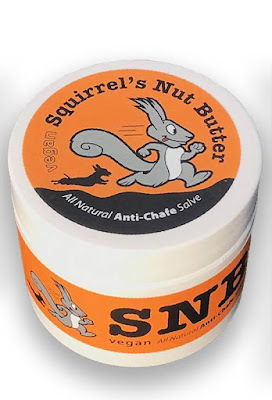 Squirrels Nut Butter makes an anti-chafe and restorative skin salve. Chris and Stacy Thornley founded the company out of their own necessity. Their daughter battled severely dry skin and Stacy, who is a Registered Nurse specializing in allergies, decided to start exploring solutions. None of the skin health products she had found could properly help with her daughters eczema and other conditions. She put her knowledge to work and started trying to create a salve. It took a ton of trial and error, but finally an effective product was created. Chris and Stacy started offering the product to friends and family around Flagstaff, where they live. Everybody loved it! Eventually the new product made its way to a guy whose nickname is Squirrel (who works for Chris’ tree cutting company). He tried the product instead of his normal anti-chafe product and raved about how well it worked. Chris came up with the name and started marketing the product to endurance athletes. Once he knew he would be able to sell the product, it was time for a name. Because the original blend was made with almond oil, he knew the name had to be Squirrels Nut Butter. Squirrels Nut Butter is now made with four simple ingredients; coconut oil, cocoa butter, beeswax, and vitamin E oil. They have been selling their product since 2015 and it has really taken off. It is now utilized in several sports including running, cycling, triathlon, hiking, and any other sport where chaffing may be an issue. They now have a spicy salve for pre and post workouts called Born to Rub. 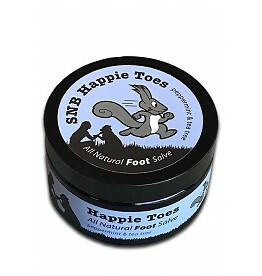 Happie Toes is a foot-specific salve blended with peppermint and tea tree oils. They even have a vegan version of the original Squirrels Nut Butter. In addition to being an anti-chafe product, it prevents blisters on your feet and can heal and restore your dry, irritated skin (including eczema). I have been using Squirrels Nut Butter for months now and have to say that I like it way better than the other products out there. There are several reasons why. The first reason is that it isn’t clumpy like Bodyglide. It isn’t greasy and won’t stain your clothes like other products either. It isn’t made with a ton of chemicals that I can’t pronounce. It simply is easy to put on and works forever. I ran my recent 50 miler and didn’t have a single chaffing issue after 13.5 hours of really wet and hot running. I couldn’t have thrown more at Squirrels Nut Butter and it protected me like my own personal secret service. They recommend that if you are looking to use it in colder temperatures, that the stick works best, which is my favorite option. They also have a double-walled tub that works great in heat up to 120 degrees. In cold weather the SNB can get rather hard. I just rubbed it between my hands for a few seconds to have it melt. Then I applied it where needed. I really liked the Happie Toes as well. My feet really get thrashed, especially when I am doing a lot of runs in the rain and mud. My feet get dry and sometimes even start to crack. Other brand’s products are okay, but I really liked the effectiveness and feeling of the Happie Toes. I can’t say enough good things about Squirrels Nut Butter. It really is an amazing product and would definitely recommend it over other products. The only downside is that because it is made with cocoa butter, it does have a chocolaty smell (more like cocoa), which makes me want candy. Hopefully it doesn’t make a bear think I am a huge candy bar.